It's difficult to imagine a time when Jean-Pierre and Luc Dardenne weren't at the forefront of world cinema. But it wasn't until the Belgian filmmakers released Rosetta in 1999 and won the Palme d'Or at the Cannes Film Festival that the world really began to sit up and notice. The pair had released La Promesse three years prior, which they consider the true beginning of their career, to great critical acclaim, and the Cannes accolades for Rosetta were the affirmation of the brothers' cinematic prowess. Their reputation would be cemented in 2002 when their next film, The Son, won two awards at Cannes, followed by another Palme d'Or win for L'Enfant in 2005, officially heralding their status as critical darlings and favorites on the Croisette. Nowadays their names are familiar to all cinephiles, and they are doubtless two of the most accomplished and lauded filmmakers working today. But back in 1999, Rosetta was something of a blindside. And while they have arguably made better films since then, Rosetta was an early indication and maturation of their very distinctive style. Emilie Dequenne as Rosetta and Fabrizio Rongione as Riquet. As pointed out in one of the bountiful extras on the spiffy new Criterion blu-ray, Rosetta is the duo's most female-centric film, even more so than 2009's Lorna's Silence. We first meet our heroine, Rosetta (Cannes Best Actress winner Emilie Dequenne), as she is running from some unknown assailant inside a factory. This kinetic, jarring opening drops us right in the middle of Rosetta's hard scrabble life. We soon realize that she isn't under attack, that her pursuers are her employers, and that she has just been let go from a job she desperately needs. Unwilling to leave, she pleads with them as she evades their grasp. But she isn't begging for their mercy, she's demanding that they keep her on. That's what sets Rosetta apart; not only is she fiery and strong willed, she doesn't just ask for what she wants, she demands it - and refuses to take no for an answer. Rosetta, it turns out, is very poor, and the sole bread winner for her family. Her mother is a listless drunk who sleeps around with men (including their hard nosed landlord) for money and breaks on the rent. When food is scarce she catches fish in illegal fish traps near her home. A job is all that stands between her meager trailer park life and the street. Jobs, however, are hard to come by. Increasingly desperate and at the end of her rope, Rosetta becomes willing to do whatever it takes to procure even the most menial of jobs, even if it means betraying those close to her. But will finding work be worth stepping on others? Or will it make her just another cog in a ruthless and unforgiving system? Emilie Dequenne as Rosetta. Courtesy of The Criterion Collection. 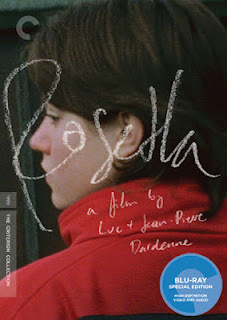 Kinetic and almost uncomfortably realistic, Rosetta has all the traits we have come to expect from the brothers Dardenne - sparse dialogue, handheld camera work, lack of musical score. It foreshadowed the emotional depth of their films to come (including their most recent film, The Kid with a Bike, which recalls Rosetta in certain ways). It is its raw naturalism that makes the film so striking. Dequenne's cherubic, boyish face becomes something of window on which the audience can project itself, at once fiercely singular and familiar enough to be anonymous. Rosetta is a lost girl who is lost not for lack of trying, but for lack of opportunity. It is not a political film per se, but it is most interesting, especially in an election year of such heated rhetoric, to look back on a film with such immediate social themes. This girl finds herself in deep poverty, completely left behind by the system, and not through any fault of her own. She wants to work, needs to work, every fiber of her being strives for it. No one works harder than Rosetta. Yet despite her best efforts she still finds herself scraping the bottom of the barrel. The Dardennes have a very clever way of illustrating a point without ever overstating it. In Rosetta the inherent essence of her struggle is clear - sometimes pulling yourself up by your own bootstraps is impossible when there is nothing to hang your bootstraps on in the first place. Though not an American film, it's easy to see Rosetta's struggle applying here as well. It is a universal tale of survival as told through the most relevant and contemporary means. Through what Kent Jones calls "radical economy" in his essay included in Criterion's new release, the Dardennes convey so much using so little, the seemingly strung together nature of the film ultimately containing a very specific and carefully plotted structure that brings a gravity to even the most mundane of events. Rosetta isn't just about one girl. It's about a whole class of people left behind by a faceless society in motion..
ROSETTA | Directed by Jean-Pierre & Luc Dardenne | Stars Emilie Dequenne, Fabrizio Rongione, Anne Yernaux, Olivier Gourmet | Rated R for language | In French w/English subtitles | Now available on blu-ray and DVD from the Criterion Collection.